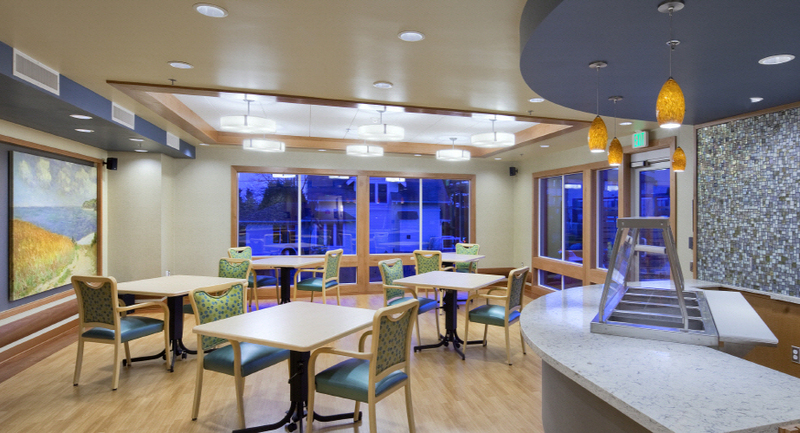 The Columbia Lutheran Home dining room expansion creates an alternate, informal dining venue for residents. 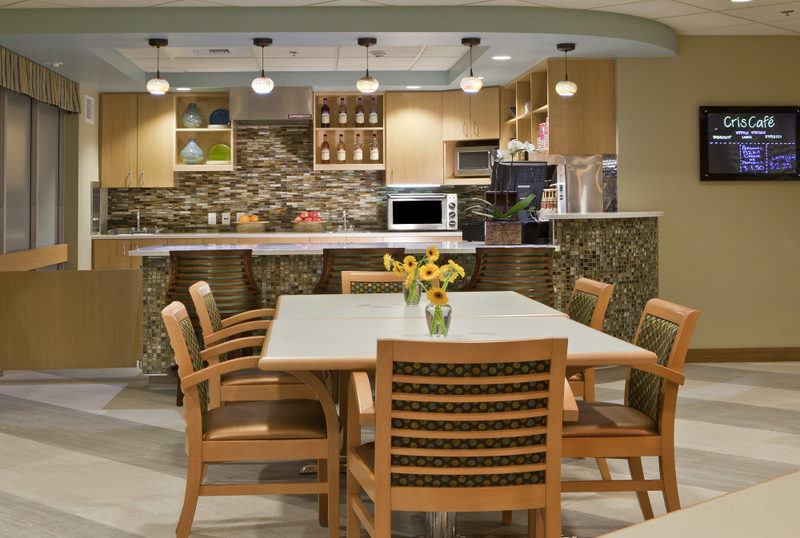 The bistro-café element in the southwest wing is both a departure from the existing institutional seating and provides the residents more choice with plating at the new service counter. Glass-mosaic tile, abundant natural light and accent lighting bring an atmosphere of fun and sparkle to the spaces. The project design process was a 2-step process, because the original building was already at the maximum allowable floor area for the size of the site. 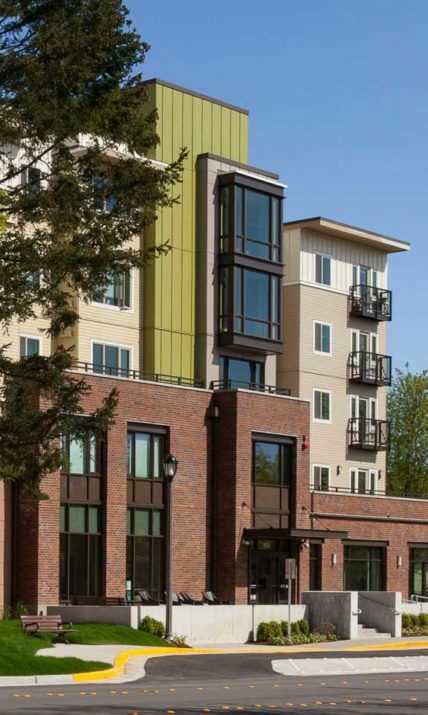 In the first year of the process, SAGE prepared variance documentation and helped Columbia Lutheran document comparisons with neighboring properties and explain the justifications for the very needed and beneficial expansion. The use of clear diagrams and professional documentation of neighborhood data helped win the zoning variance for the building expansion. 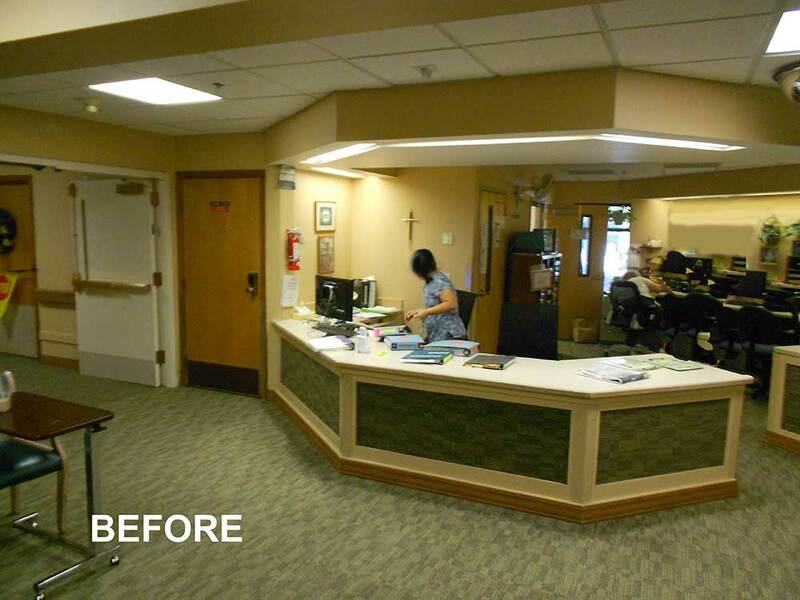 A great example of targeting renovation to achieve highest overall organizational value, the Columbia Lutheran renovation and expansion provides multiple benefits. Besides benefiting the dining and food services program, the expansion, which is at the most highly visible corner of the building, created the opportunity for a new tower element. Visible from the main entry and from the exterior, the tower addition provides a new, signature design feature that ties in with, as well as updates, the 1960’s building. The large windows of the dining rooms both delight residents and are a beacon for the quality of care and social vibrancy found between elders, staff and family members. The original patio was too small to accommodate popular summer barbecues attended by residents and family members. 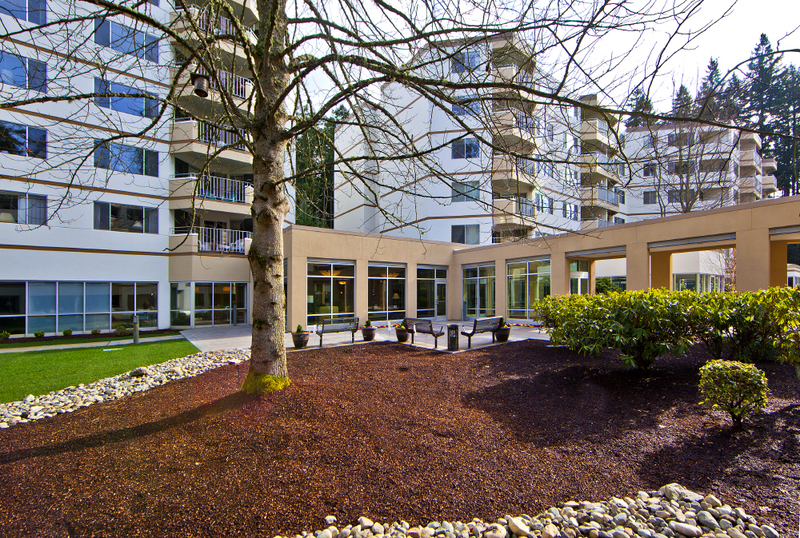 With regrading and use of small retaining walls, the patio was expanded to a large elliptical paved courtyard with a fountain. 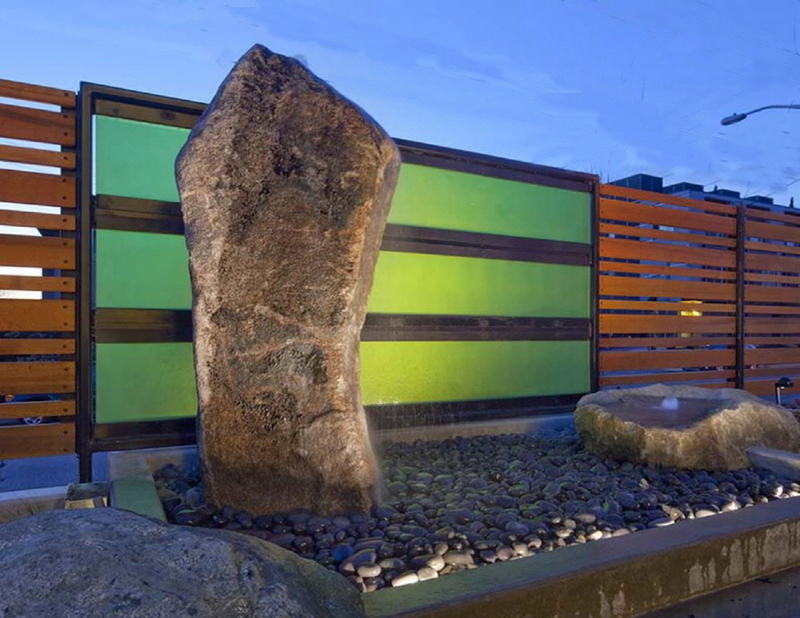 The fountain is positioned across from the dining seating and is highlighted with a green translucent fence panel, back-lit at night to serve as a focal point from the dining room. The fountain features large granite stones from a local quarry. The tranquil bubbling sound of the fountain is a welcome feature in the highly popular seating area that can now happily accommodate socializing with visiting family. The images are for the sole purpose of representing the architectural services of SAGE. 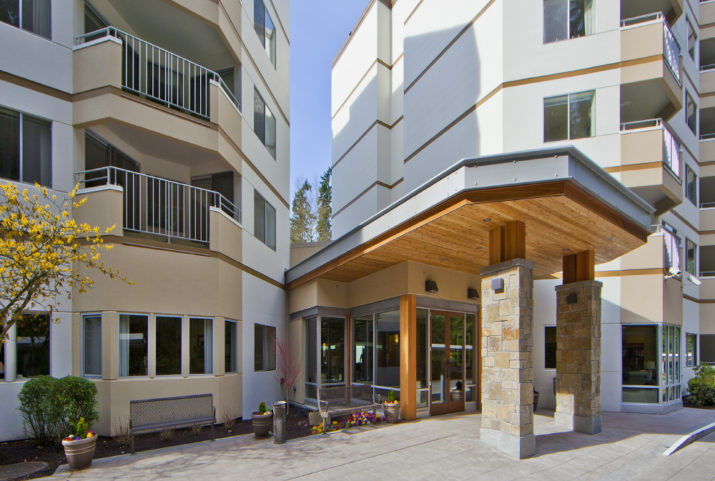 Providence John Gabriel House is a 5-story, 75-unit affordable senior housing and mixed-use project in downtown Redmond that contains a Program for All-Inclusive Care of the Elderly (PACE) facility. In addition to the PACE component, common lobbies, plazas, secure underground parking and various on-site amenities are provided. A city-wide pedestrian pathway runs through the site. The project site is well suited for a senior community with its proximity to the QFC and Bella Bottega Shopping Center, Redmond Library, Redmond City Hall and Municipal Campus plus many other adjacent and nearby services including medical, recreational and banking facilities. In turn, Providence John Gabriel House adds to the neighborhood and helps create the feel of a vibrant, walkable urban village. The mixed-use facility is the result of several years of effort by so many. 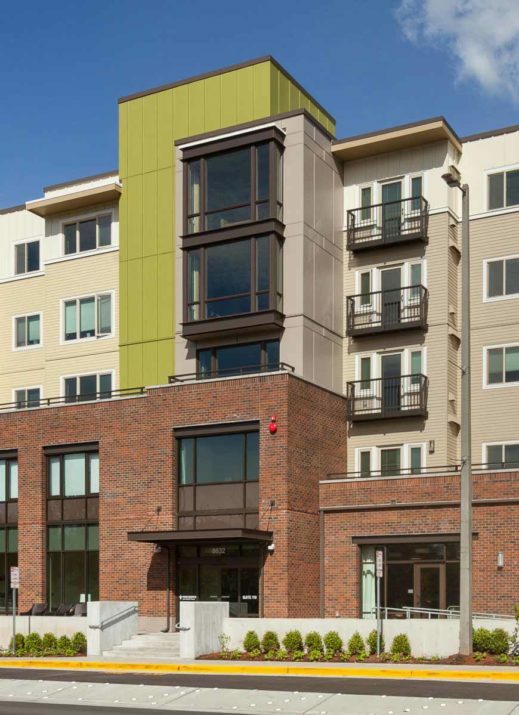 Providence is the owner and operator of the building; Shelter Resources, Inc. and Bellwether Housing were involved as the project and owner developers; SAGE Architectural Alliance was the architect; Walsh Construction was the general contractor and the City of Redmond maintains ownership of the land. 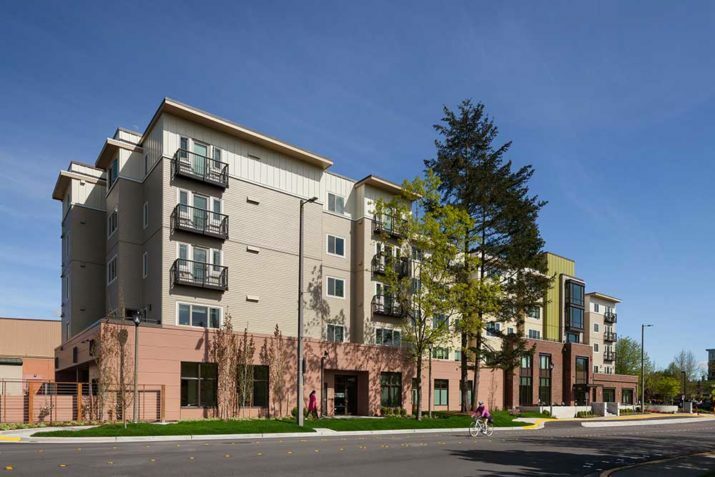 Funding was provided by A Regional Coalition for Housing (ARCH), King County Finance and Washington State Housing Finance Commission’s 9% Low Income Housing Tax Credits. 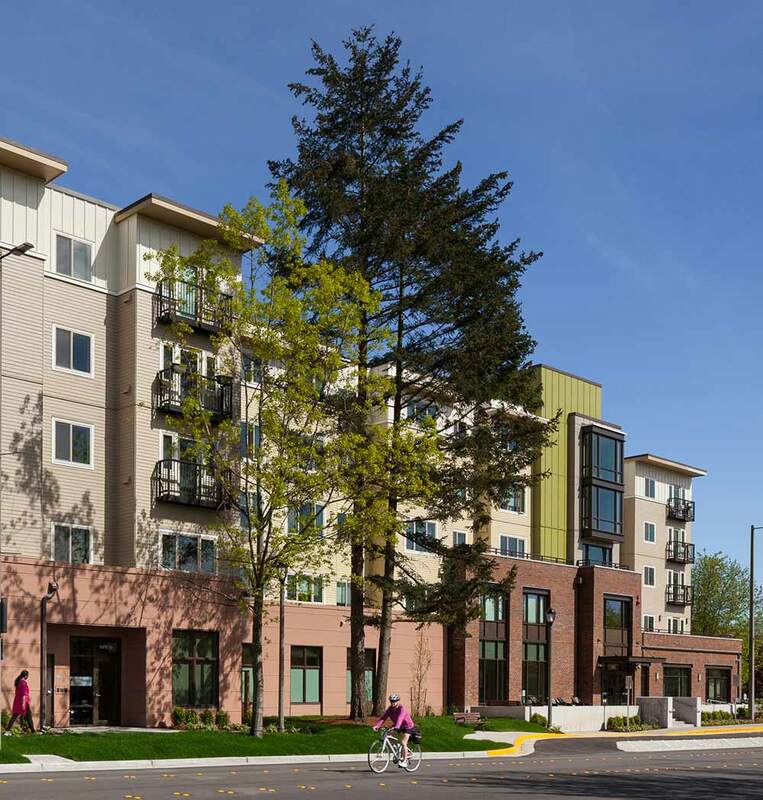 Prior to the start of the project, the city-owned site was well studied and evaluated, with assistance from ARCH, to determine the most appropriate future use of the site—senior housing was the determination of the study. In 2013, the project was awarded, through the RFP process, to the Providence-Shelter-SAGE team. The team’s proposal not only included senior housing but added the PACE component. 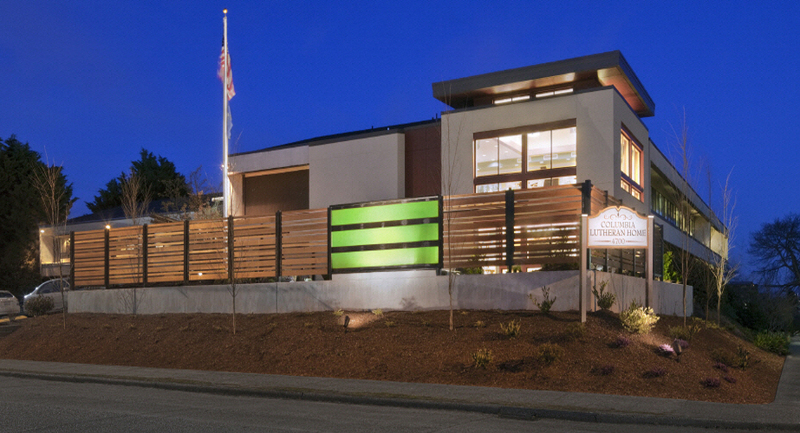 Bellwether and Walsh Construction were later added to the project team. As part of the first design phase, SAGE researches site and context information for their projects, and for this project the research included meeting with the administrator of the Senior Center located just two blocks away and learning about their very robust senior’s programs. SAGE also learned about their need for more spaces for the wellness and exercise programs. 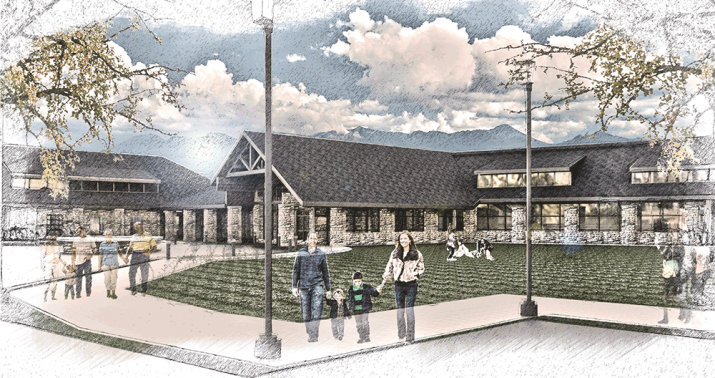 To address the need, SAGE successfully advocated for including a multipurpose room as part of the new project. Glass doors and windows look into the multipurpose room from the central lobby. Now when residents come and go through their lobby, they see ongoing exercise and wellness classes and are drawn into the healthy, socially-connected lifestyle. Social connection is one of the most important predictors of healthy aging. 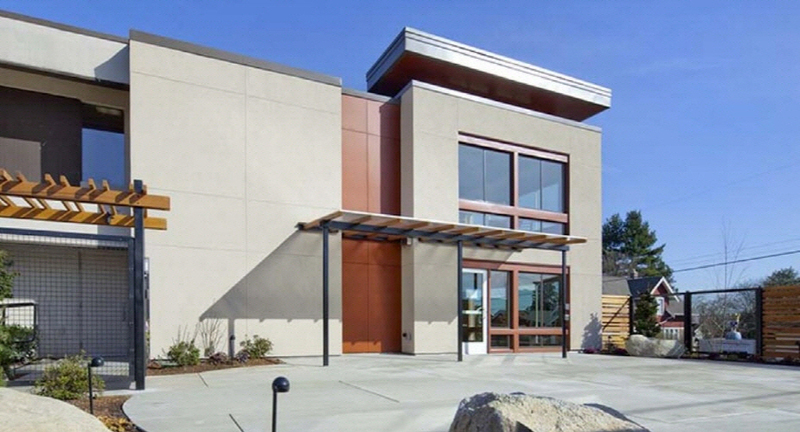 The central commons were designed and programmed as a place residents can come any time of day for reading, computer access and informal social opportunities. 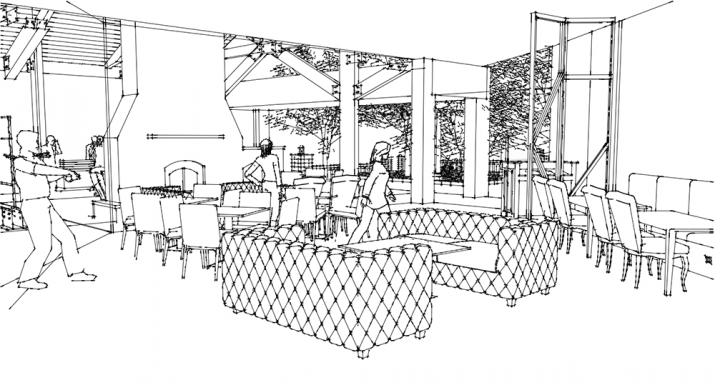 A wonderful patio seating area is located just outside the commons. 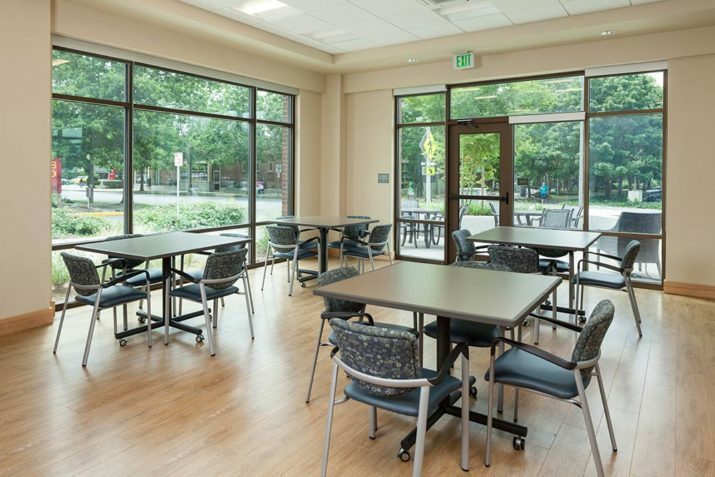 The commons and multipurpose room are oriented to the south and west for natural light and connection to the existing pedestrian path that connects to the Senior Center. In consideration of aging in place, strong effort was made to eliminate entry stairs and use ramps for ease of wheelchairs, canes, and walkers. All units are accessible and have roll-in showers. 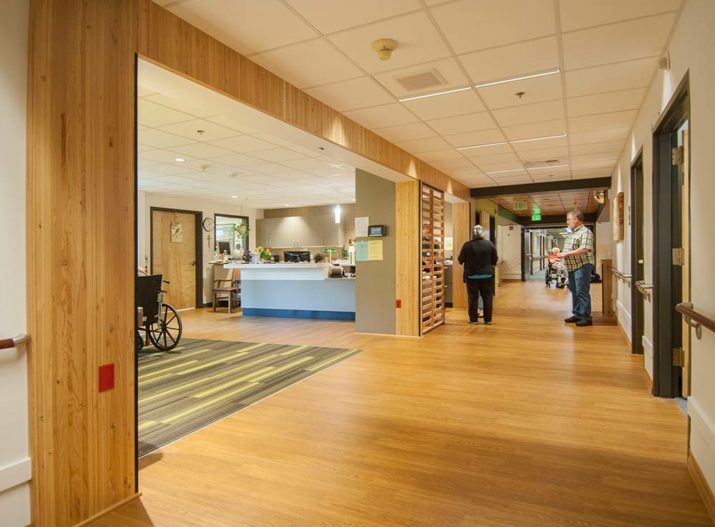 The Program for All-Inclusive Care of the Elderly (PACE) center is an ideal resource located at the north end of the main level. The program serves frail elders, largely from the broader community, who are brought to the center 2 to 3 times a week by vans to share in the social programming and nutritious meals and to be overseen by their full care team of doctors, nurses, social workers, dentist and podiatrist. With these resources and oversight, residents in the surrounding community are empowered to continue living at home. 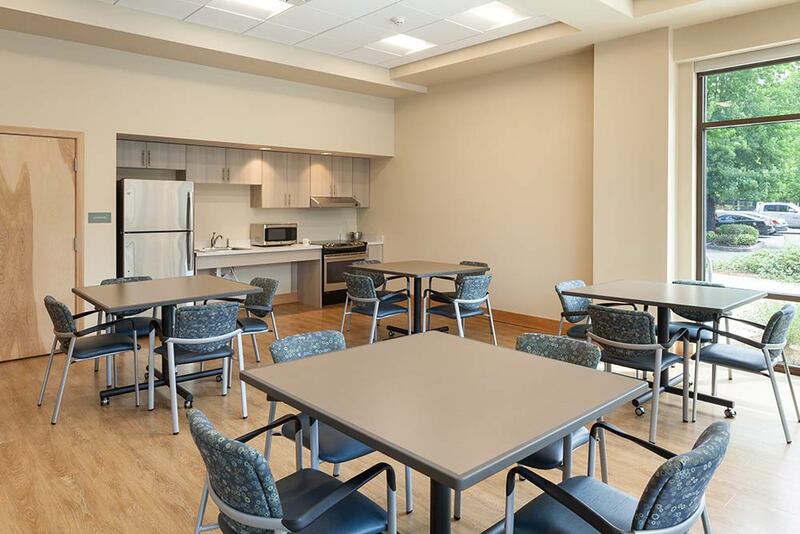 While most of the new residents are not at the level of frailty served by the PACE center, 8 apartments were initially dedicated to residents participating in the PACE program. 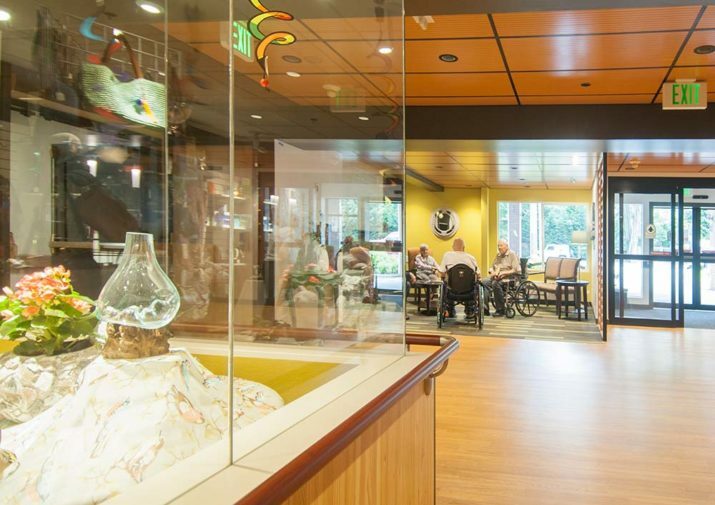 These residents are able to live independently, supported by the PACE program, when they might otherwise need the care of a skilled nursing facility. During design development, SAGE applied for and the project won the opportunity to participate as the focus of a King County Green Building Workshop that brought together green building regional experts to brainstorm project suggestions. 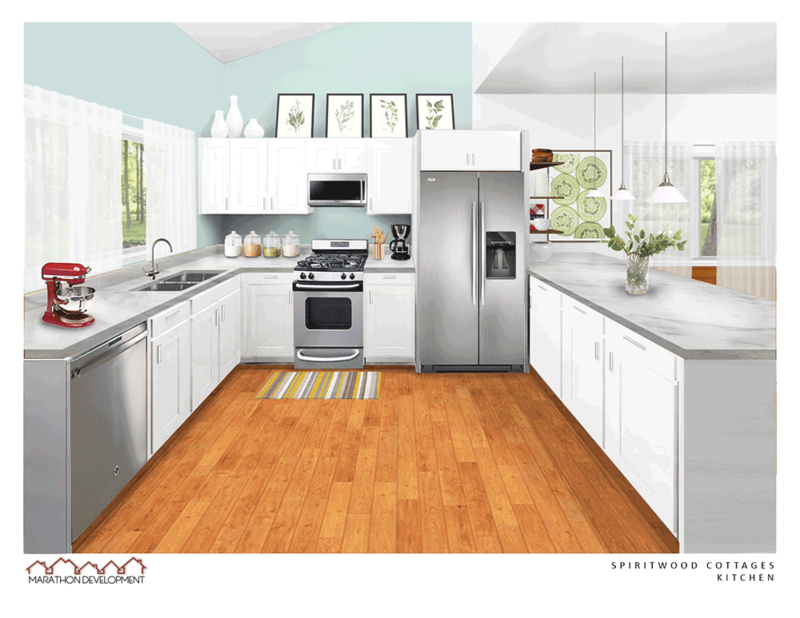 Many of these suggestions were included in the design. The project meets and exceeds Evergreen Sustainable Design Standards with efficient radiant cove heaters; trickle vents; LED light fixtures; low-flow shower heads, faucets, and toilets; Energy Star appliances; no garbage disposals; drought-resistant and native landscaping, along with mulching; readiness for roof photo-voltaic panels; individual energy meters; and a healthy, healing environment with vegetation visible from the windows, including planted pots on the Juliet balconies and the existing trees that were preserved. 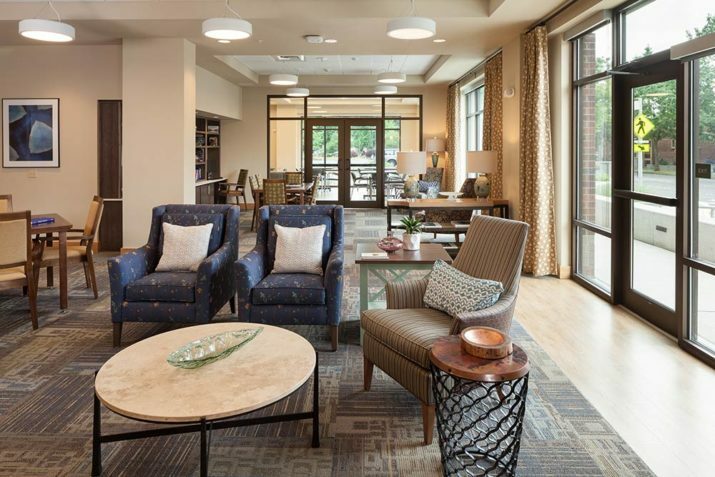 This project is a highly successful repositioning of the 200 unit independent senior housing complex by SAGE Architectural Alliance and Sechrist Interior Design. The project renovated the central commons to create a vibrant community hub where residents can come any time of day for social connection. 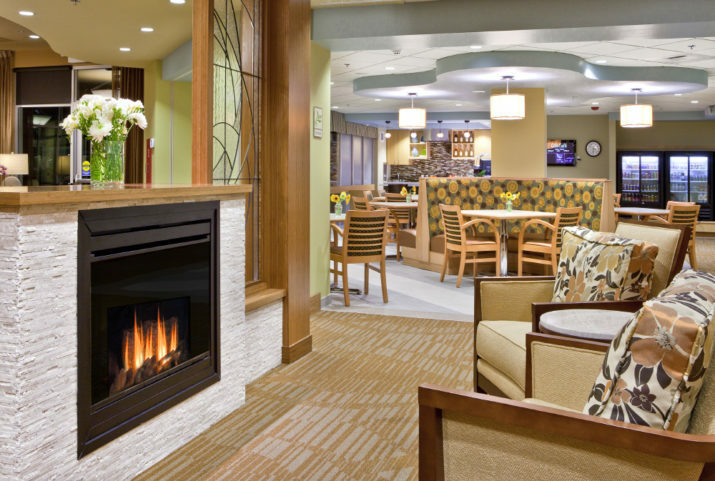 The confining walls of the small lobby were removed, creating a spacious entry while adding active social spaces: a new bistro-cafe, fire-side lounge, library, and mail room. Residents and staff were thrilled with the results. The renovation of the Foss Home lobby dramatically transformed the main entry lobby to a welcoming and attractive community space. 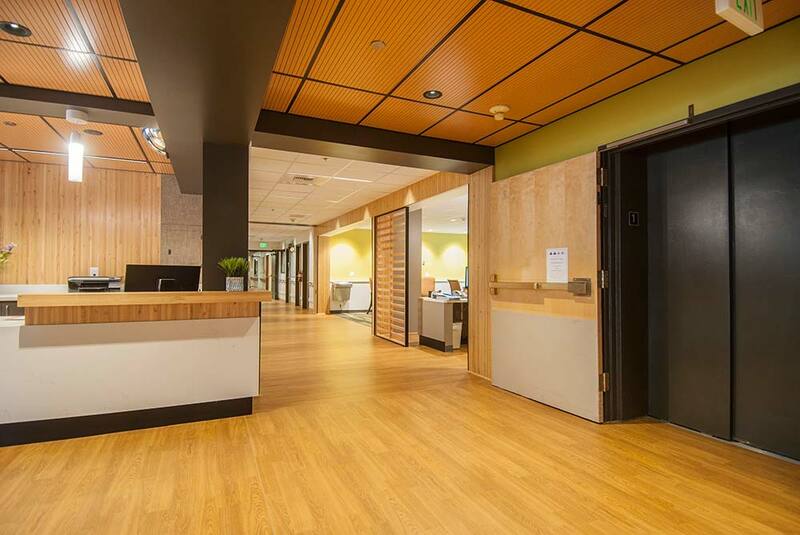 The new lobby is a radical departure from the previous medical environment, which dated from the prior, 1994 renovation. 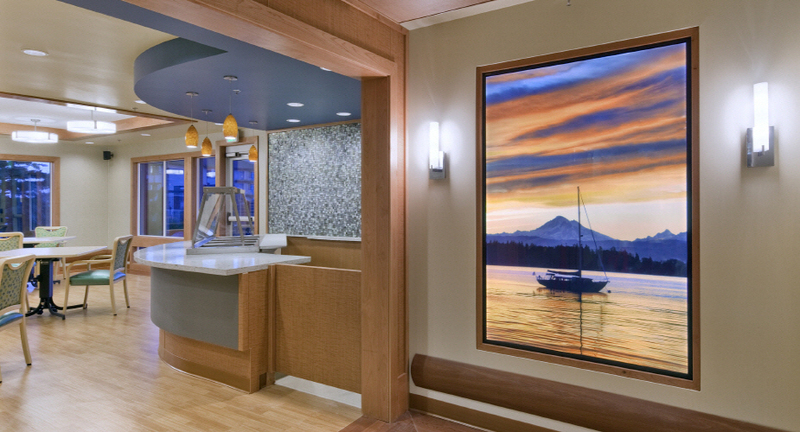 Instead of the nurse station dominating the main entry lobby, the renovated lobby provides warm hospitality. 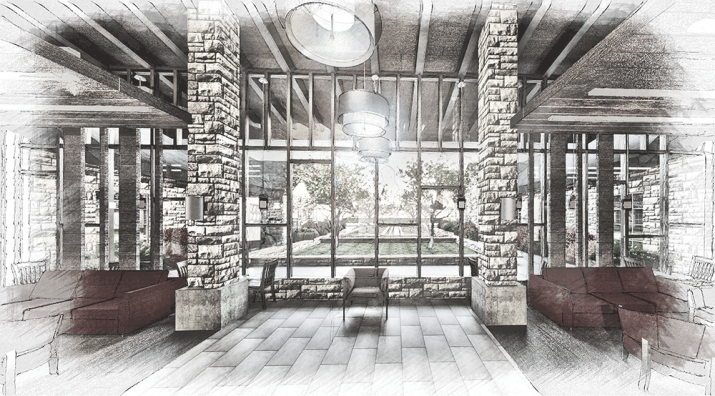 The main entry now features the reception desk, gift shop and fireside lounge, all designed with hospitality in mind. 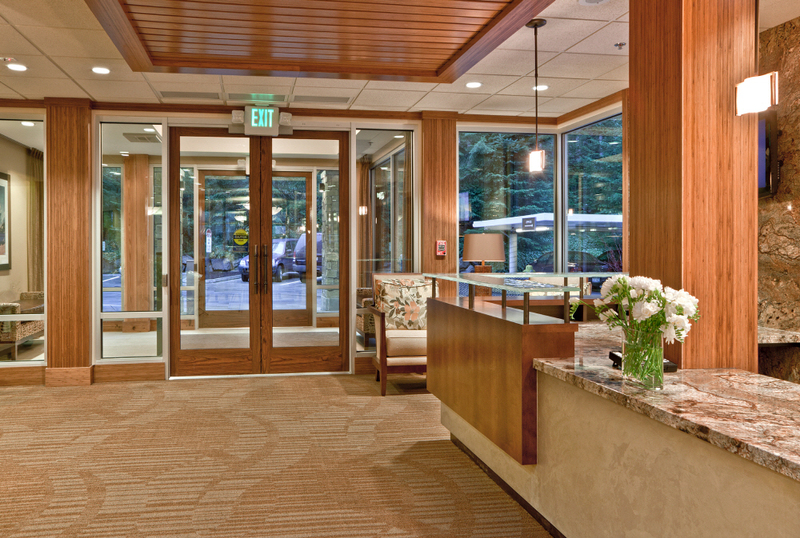 The arrival area features a faux-wood floor and wood-paneled ceiling that is accentuated by dark column and beam structure. 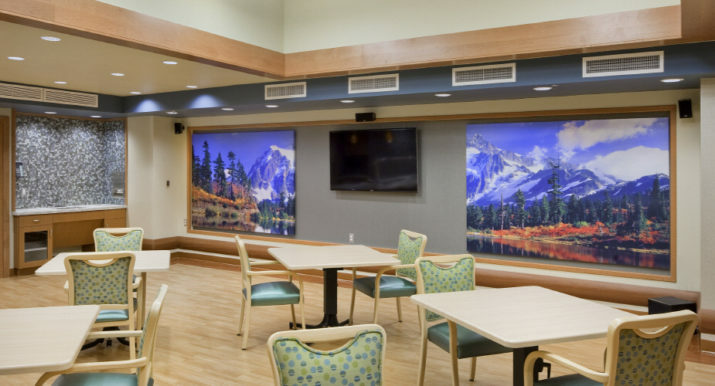 The color palette is designed to lighten the serious nature of skilled nursing and rehab by appealing to a sense of visual delight. The atmosphere is brightened with yellow, orange and light green in addition to the sparkle of accent lighting. 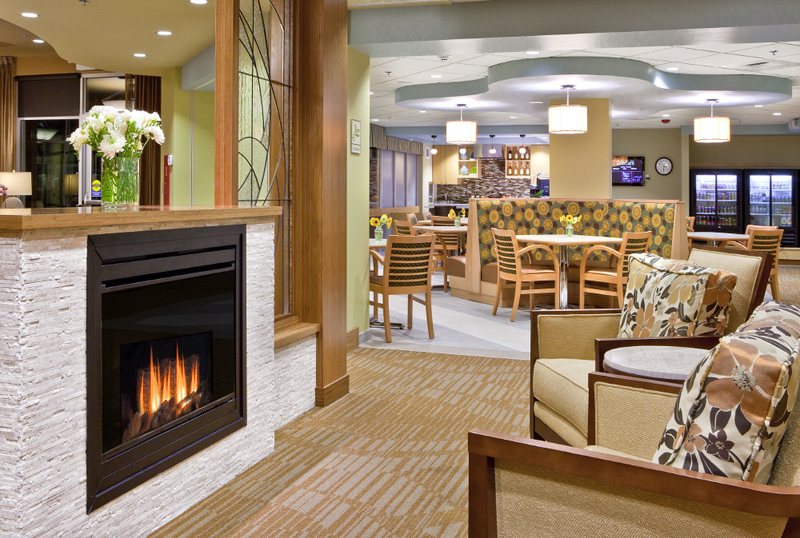 The fireplace seating area to the side of the main entry has taken the place of the nurse station. 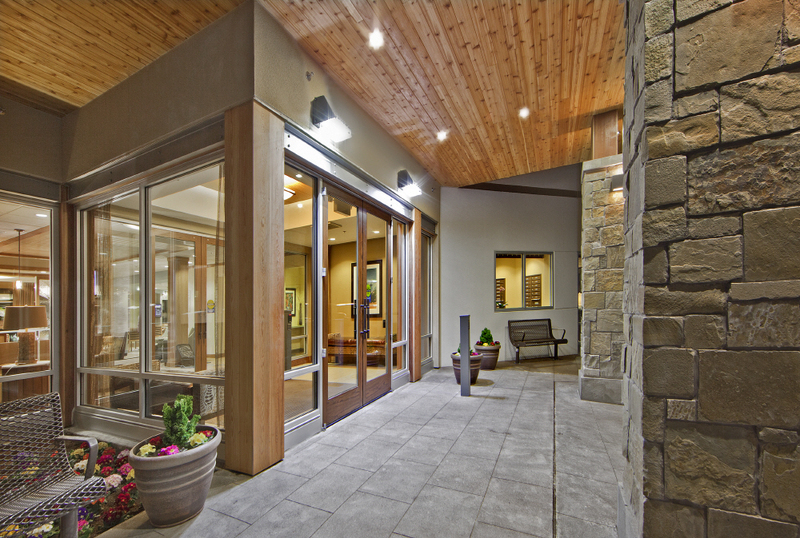 This creates a wonderful people-watching spot for residents waiting for their ride. From this spot, residents can watch all the activity of the community. 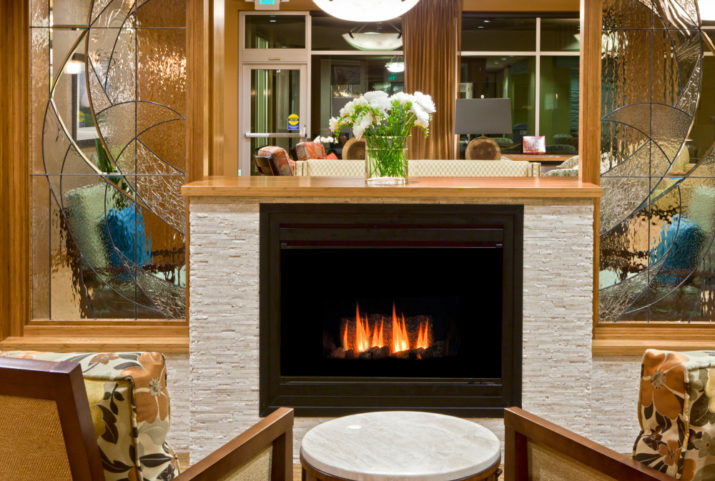 The fireside is also a great space for meeting with visitors or just watching the flicker of the fire. Connecting the interior of the lobby to the outside world, natural light has been more than doubled by adding new exterior windows, bringing light deep into the center of the lobby. 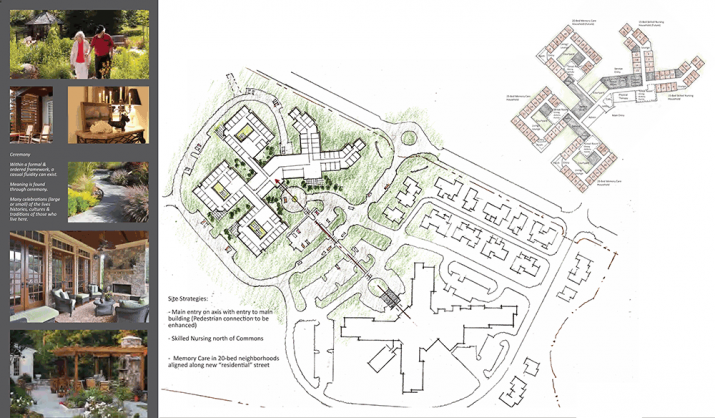 Relocation of the nurse station has provided benefits for staff as well as residents. 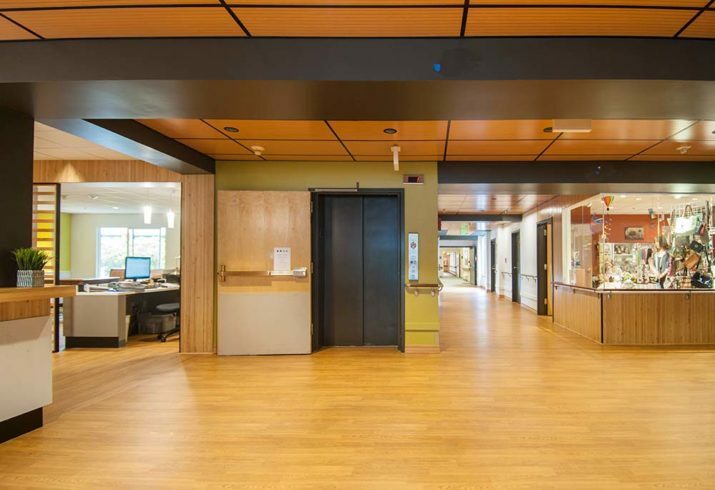 The nurse station is now more ideally located, beyond the reception desk, just down the hall where there is strong visual connection to the main dining room and much of the daily event activity. The nurse station was also down-sized because nurses now use mobile carts and spend less time at a central location. SAGE was engaged by the owner to continue the design development for 8 independent senior duplex houses after the initial site entitlements had been partially resolved. 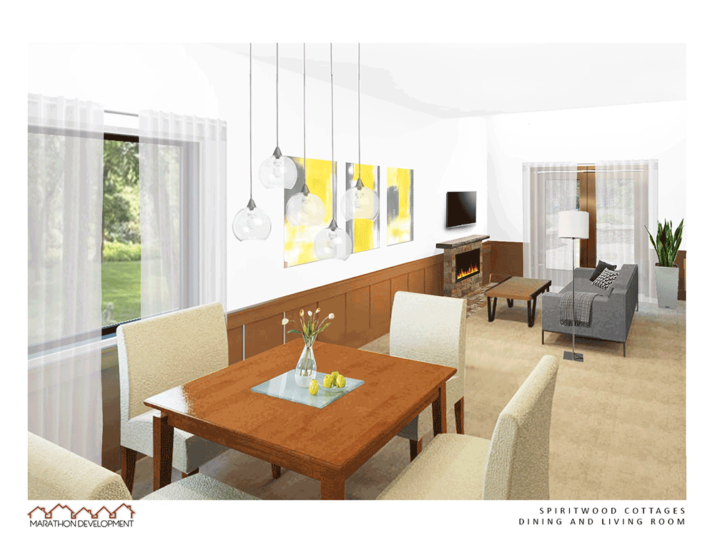 Located adjacent to the Spiritwood assisted living manor, the duplex cottages are nestled together in the wooded setting along a village lane. 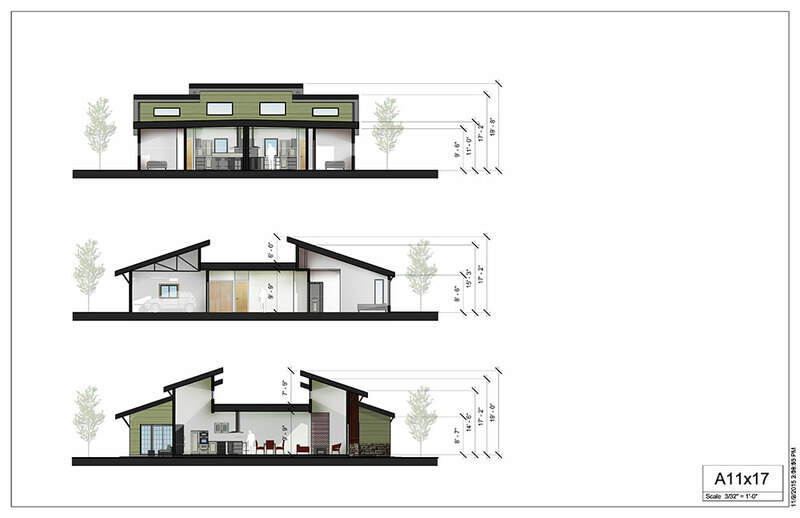 Cottages are each 1,200 SF including attached garage. 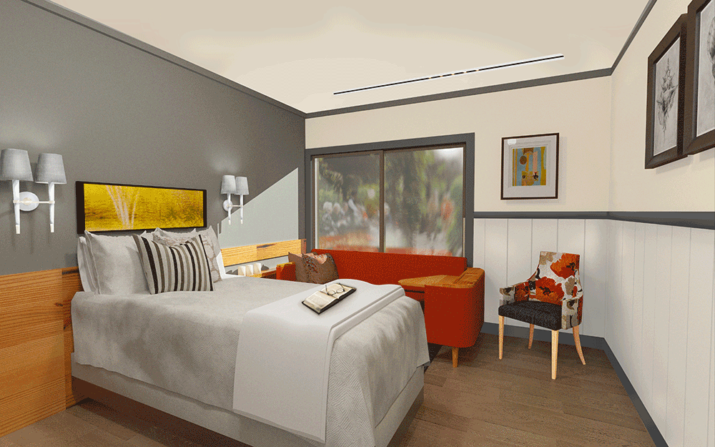 The design by the previous designer had traditional hipped roofs. However, each duplex was relatively narrow and long, causing the attics to be 14 feet high, higher than the actual single-floor living area. SAGE adjusted the floor plans and roof design to a create a contemporary village appearance that also saved the costs of the huge attic trusses. 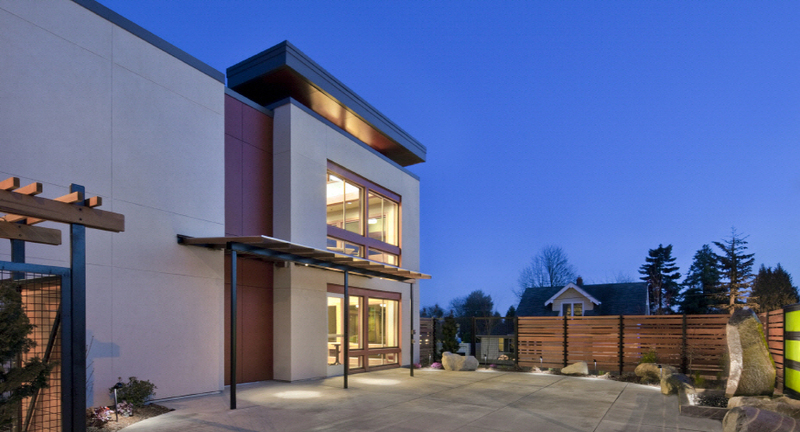 The shed roofs designed by SAGE, while lower, provide vaulted interior spaces to be enjoyed by the residents. 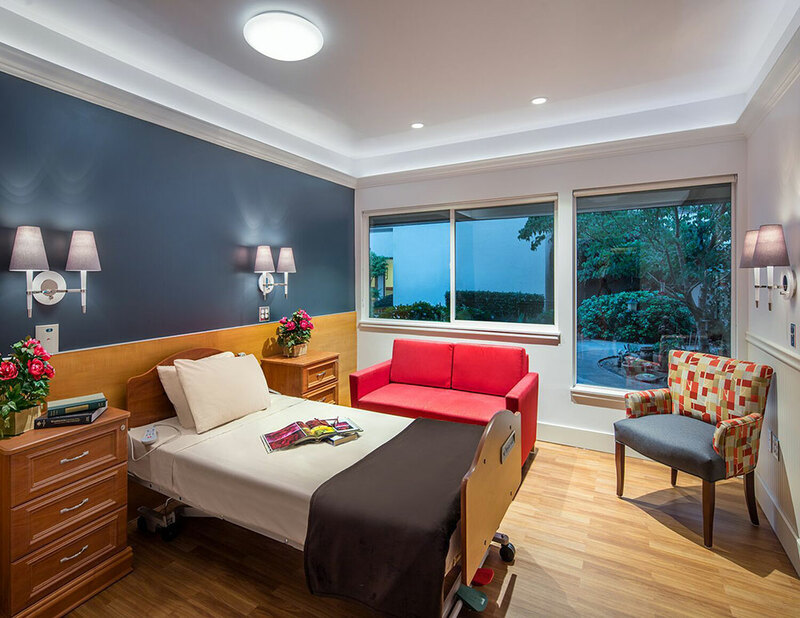 The project goal was to transform the typical medical-looking skilled nursing room into a warm and comfortable home-like bedroom that could be used as a private room or specifically for hospice. 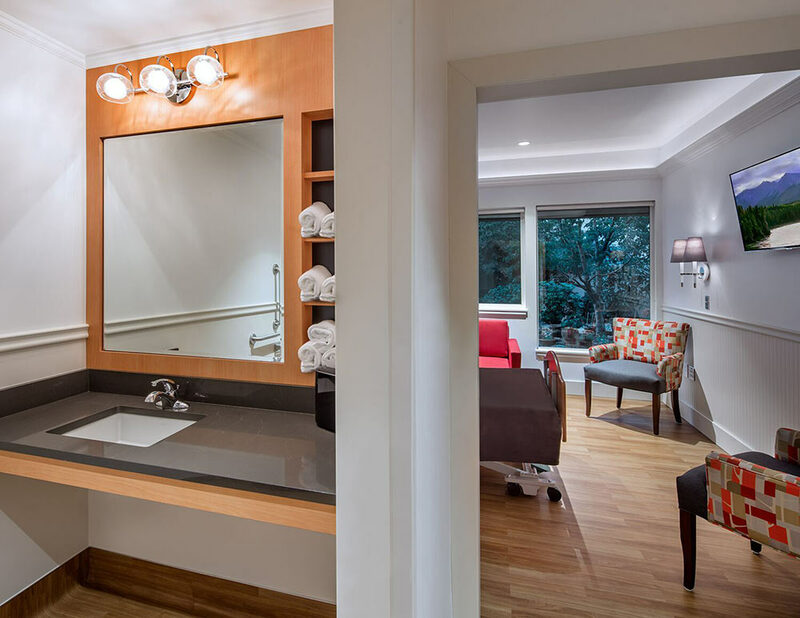 The private suite required a clean, residential appearance with highly durable and low-maintenance products typical to institutional design. 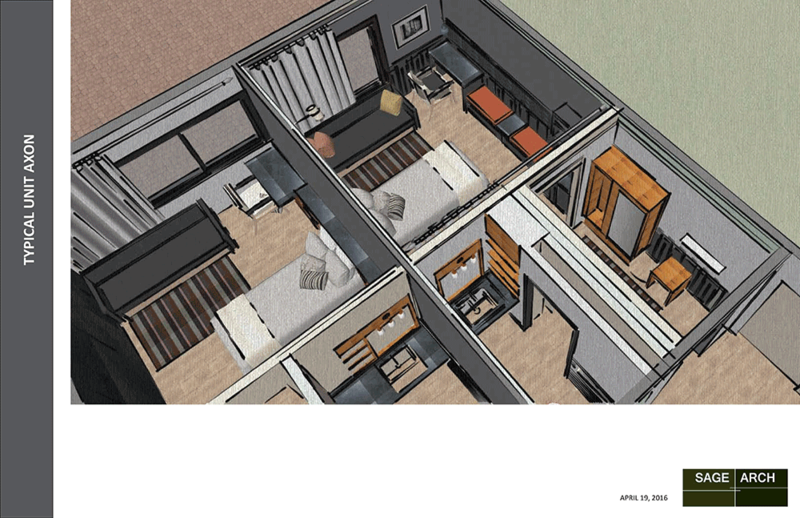 SAGE used multiple techniques to succeed with the challenge of pairing institutional design with home-like comfort. 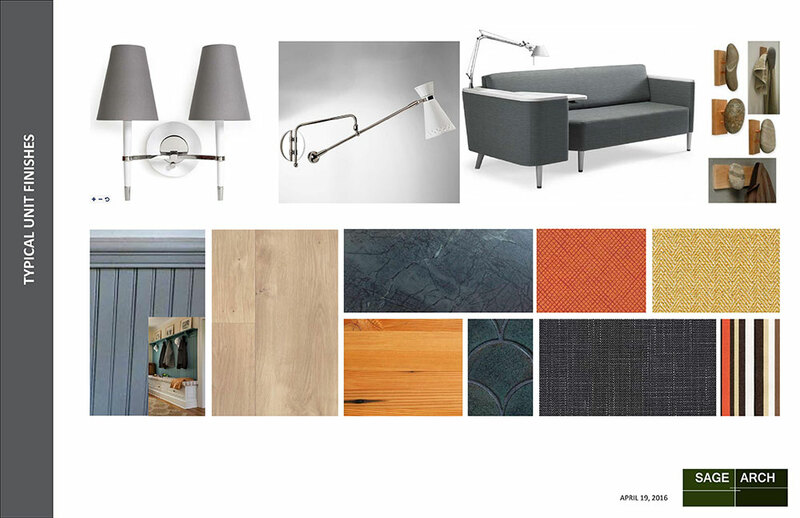 Color and material contrasts create visual interest. Instead of monotonous white walls, a dark accent wall creates a focal point for the room. The rich, dark color of this wall contrasts with the warm, reddish brown color of the wood wainscot. The bright, warm colors of the fold-out couch and upholstered chair are important design elements bringing additional rich colors to the space. 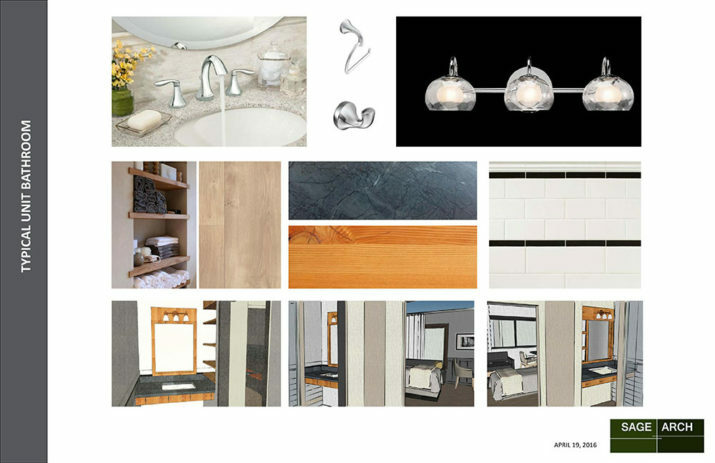 Residential touches include the white beadboard wainscot opposite the dark-colored wall, baseboard molding and the intimate placement and style of the light sconces. All of the wainscot surfaces and trim utilize highly durable composite materials, able to resist wheelchair and equipment impact as well as a heavy cleaning regiment. Lighting for residential ambiance is an important design element to the project success. 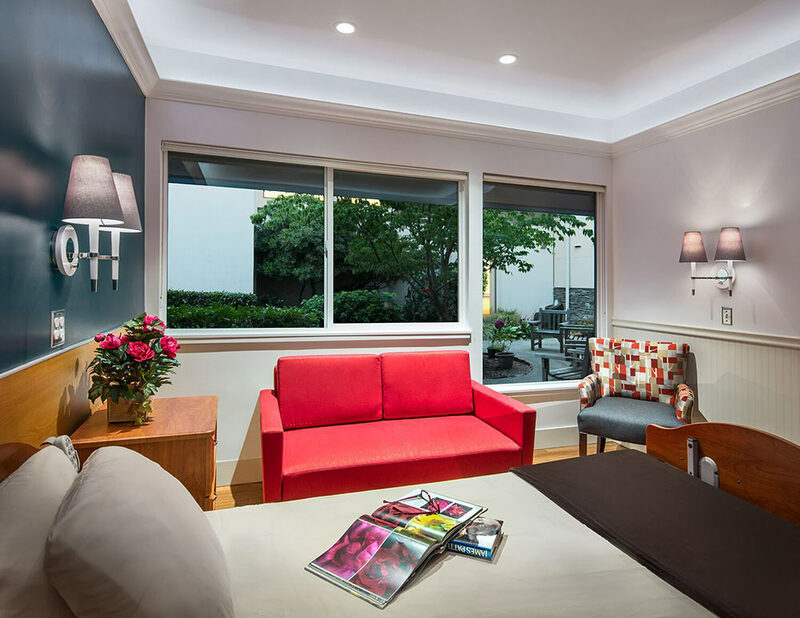 The bedroom features crown molding wrapping the upper perimeter of the room that is fitted with a linear LED rope light on a dimmer switch. The effect is magical, providing a seemingly invisible source of soft indirect light reflecting off the ceiling. 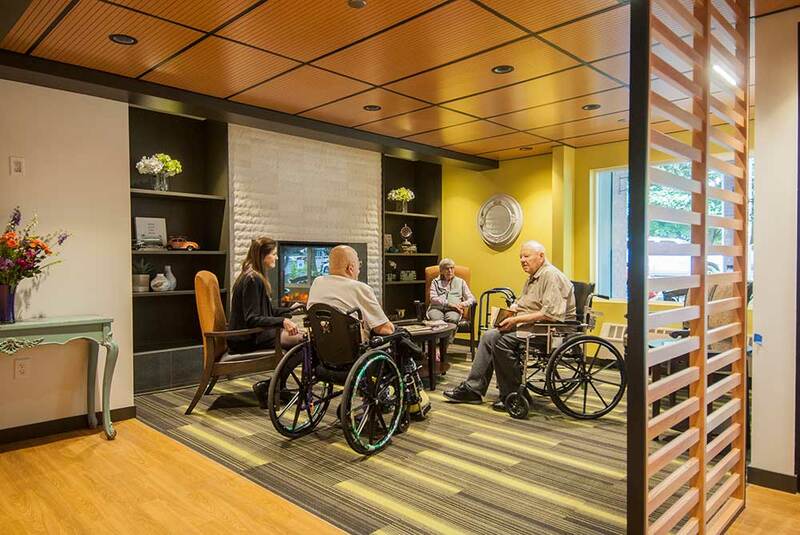 Ida Culver House is an example of design that responds to the ongoing transformation in consumer expectations of skilled nursing care, a transformation that is led by a general trend to increase options for senior living lifestyles. 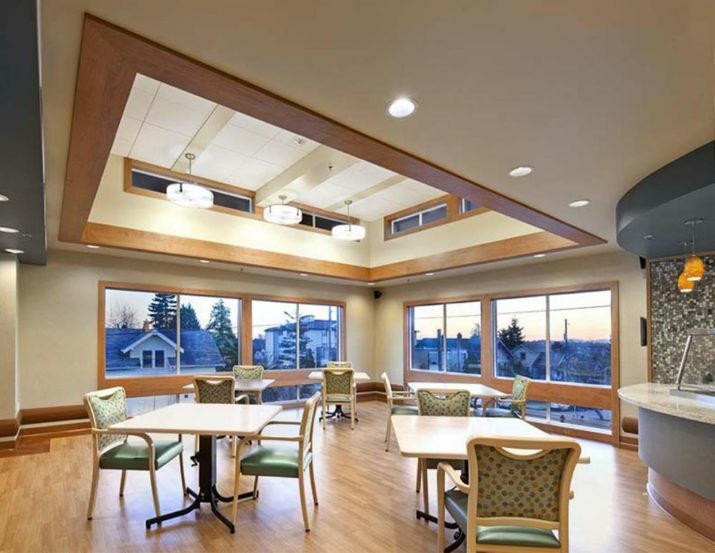 The 3-story Healthcare Center at Ida Culver Broadview is part of a larger, mostly independent senior residential community. 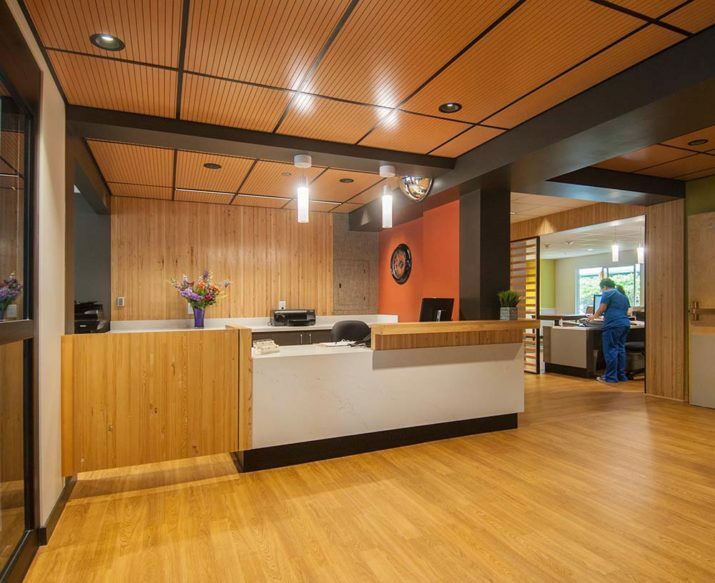 The goal of Era Living was to update the Healthcare Center, as the rest of the campus had already been updated. 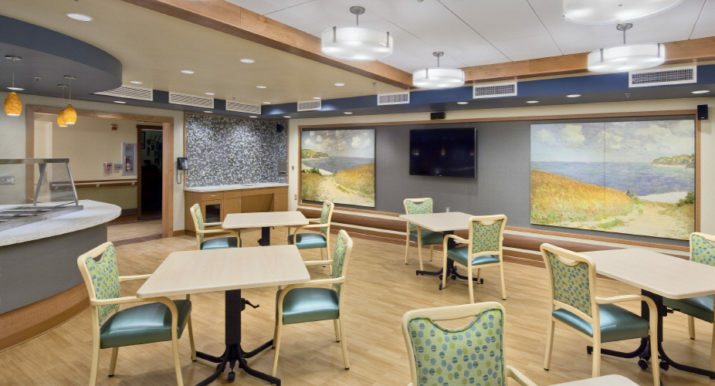 SAGE Architectural Alliance recommended modifications to transform the 1st and 2nd floor skilled nursing, highly medical environments dominated by their nurse stations, with uniform fluorescent lighting and many spaces underutilized for their intended purposes. 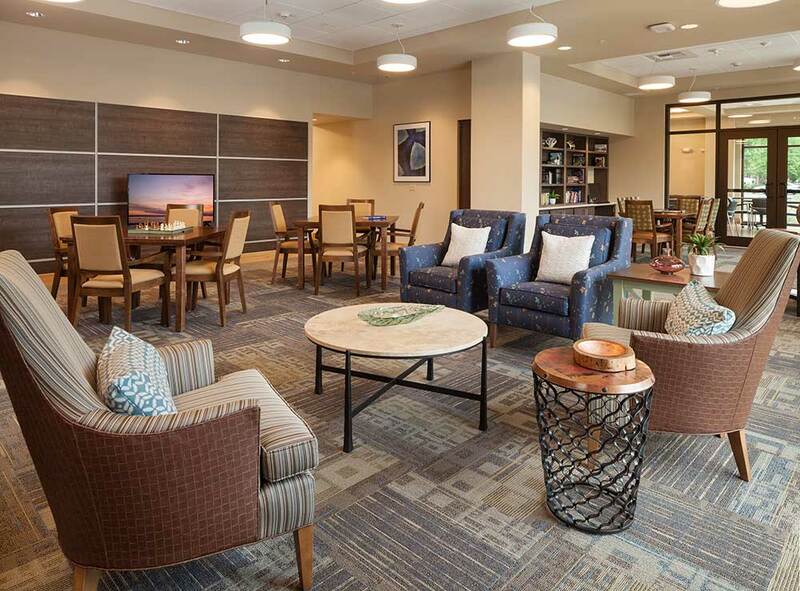 SAGE worked to create a new residential atmosphere for each floor. 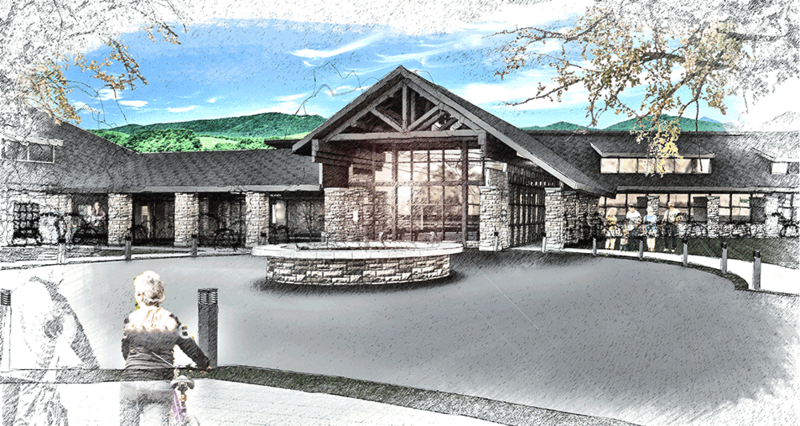 Design work includes a new covered entry and an enlarged physical therapy area. The first floor Skilled Nursing Memory Care is transformed into two internal neighborhoods around country-kitchen style dining rooms. The second floor Skilled Nursing Rehab is redesigned into a well-fitted, hospitality environment for those expecting to soon return home. Modifications include displacing the central nurse station with a fire-place lounge that partially screens the charting area. Medical carts and equipment are all removed from view by placing them in convenient niche locations. 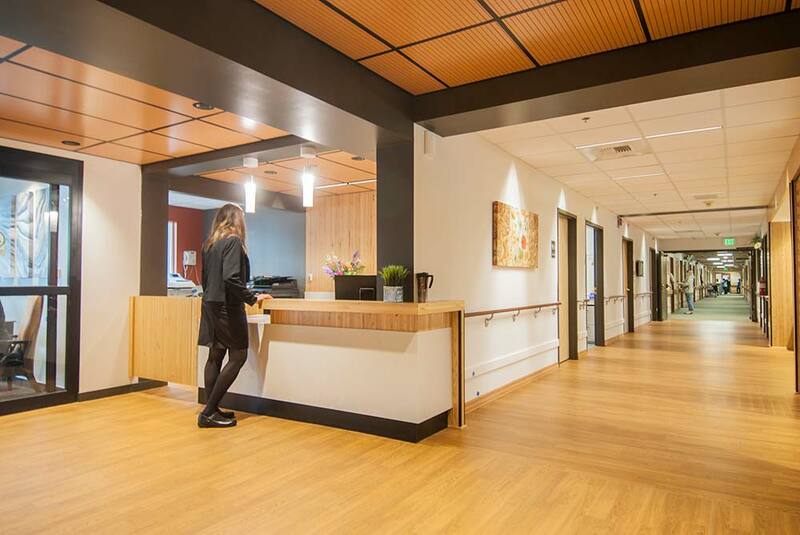 Mini-nurse stations along the residential corridor bring care-staff closer to the resident rooms for resident engagement and efficiency. All Saints Senior Living Community is a proposed affordable senior-housing project with 50 units comprising a mix of studios, 1 bedrooms and 2 bedrooms. 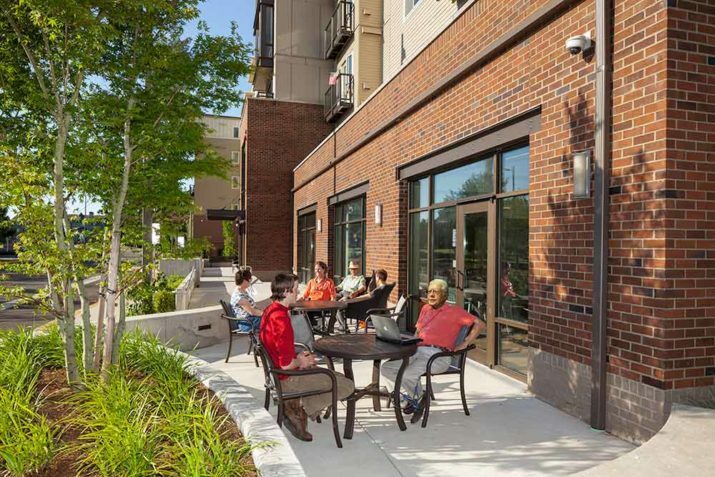 As part of healthy, community-based design, the project treats the dining area, kitchen, activities area, and parlor as communal space that opens to a front patio where residents can interact with their neighbors. 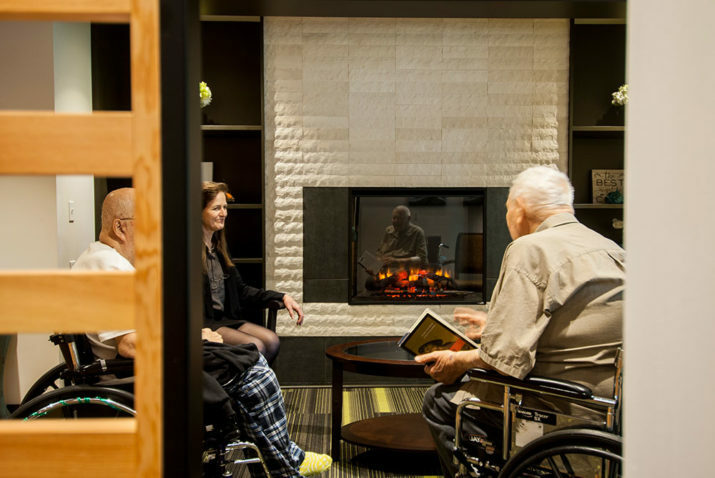 The design concept not only encourages our seniors to engage with the community but also promotes inter-generational interaction. In addition to the residential communal space, the project features a high-ceilinged multi-purpose room that is shared with the surrounding neighborhood and provides after school programs to local youth. The neighborhood has mostly single-family homes with scattered multi-family housing, including Pacific Villa Senior Housing, as well as the Korean Women’s Association Community Services Center, New Life Church, and Larchmont Elementary School. 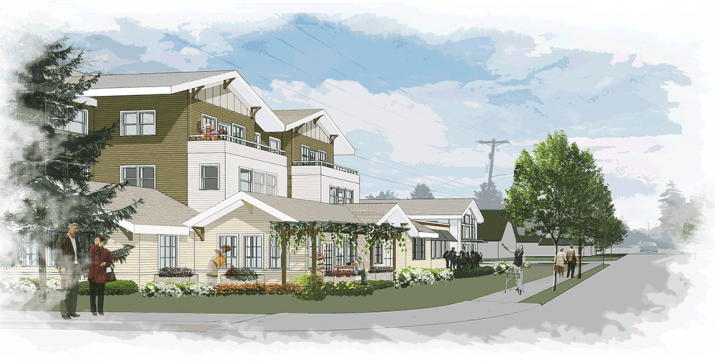 The concept for All Saints Senior Living Community is to treat it as a group of single family homes. 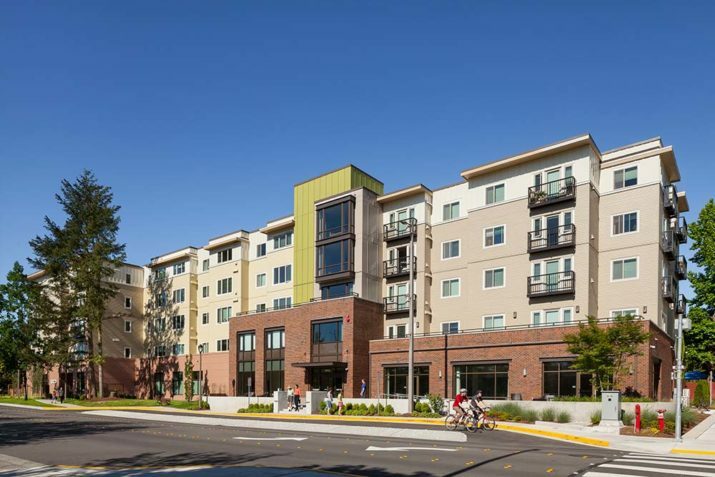 The building height steps down to one story at the street, where the cluster of low roof lines activates the relationship of the building to the context, promoting a pedestrian friendly neighborhood where the memory care residents are part of the community. 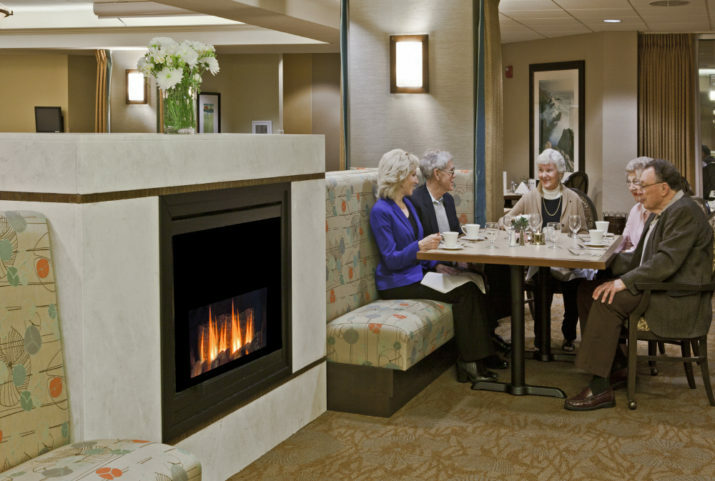 Sited on a senior housing campus across from a 140-unit independent and assisted-living community, Dupont Memory Care consists of 3 clusters of 20-private room neighborhoods. These memory care neighborhoods are paired with a 30-private room skilled nursing facility. 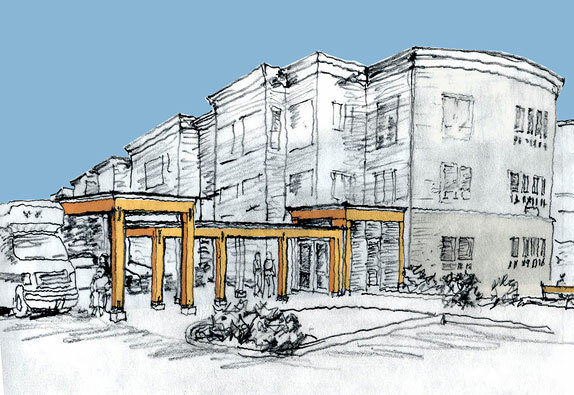 The main entry to the new project is at a shared central commons set on an axis to the entry to the main independent living building. 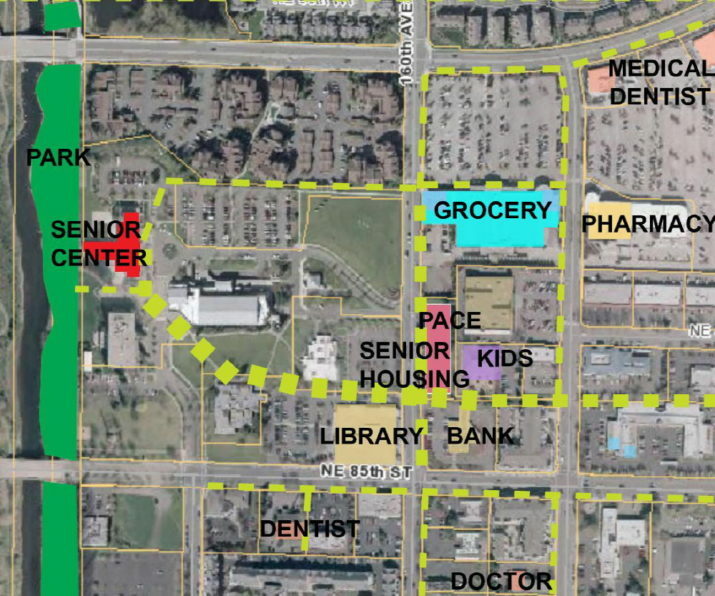 The three memory care neighborhoods are aligned along corridors that are treated like indoor pedestrian streets for variety and appeal.